Awaiting ANVISA approval for commercialization in Brazil. FMax Power is a new 8 ” medical laser device that combines IPL, EPL (IPL + RF), bipolar RF, Monopolar RF, RF Fraction, Q – switched, Nd: YYAG, Er: Glass, Er: YYAG and ND: YYAG 1064 nm long pulse This is an 8 in 1 laser platform machine, and you can use different functions with the 8 tips available. Intense pulsed light (IPL) is a type of intense, coherent broadband light source having a wavelength spectrum of 420 nm to 1200 nm. The light-based component provides optical energy that is absorbed by the specific chromophores on the skin and is converted to heat according to the principle of selective phototermolysis. Therefore the light from IPL affects pigmentation, breaks hair and hair follicles. IPL also gives a boost to the production of collagen which can make the skin younger, radiant and shiny while also eliminating fine wrinkles. Both IPL and RF have complementary depth penetration into the skin and with these special properties result in a broad application in non-ablative therapies based on the theory of selective absorption of human skin tissue and photothermolysis of light sources. The combination of IPL + RF is a more effective treatment, with no downtime and can make patients recover more quickly than conventional therapies. 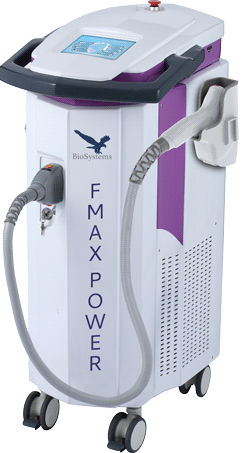 The FMAX POWER, using RF technology and unique contact cooling system that can lead to epidermis from -4 to + 10 ℃, can make the frequency energy 1 MHz RF penetrate the dermis through the epidermis to stimulate collagen regeneration, with the result of shrinking the skin and reducing wrinkling over a long period of time. The special wavelength of Q – Switched ND: YYAG can penetrate the skin of the human body according to the theory of “selective laser decomposition” thus removing the pigment by the effect of the high energy of the laser. Once the pigment particle absorbs high energy the epidermis will superficially be delimited out of the skin at the moment while the other part of the pigment will be shed and the small granules can be digested by macrophages from the body and be excluded from the lymphatic system of the body. The pigment gradually becomes superficial until it disappears completely. The Q – switched ND: YYAG absorbs black, blue with frequency of 1064 nm, red, pink, purple and brown with frequency of 532 nm in tattoos or pigmentations removing without damage to normal tissue. Er: GGlass adopts the principle of fractional photothermolysis. The pulses are presented as a matrix of microfeixes to create clotting columns in the epidermis and dermis, leaving the surrounding tissue affected. This allows the body’s natural healing process to quickly and efficiently create new, healthy tissue to fill the clotted columns .. The Er: YYAG Laser function is a new approach to treating damaged skin. Fractional technology is the latest advancement in dermatological aesthetics that softens fine lines and wrinkles on the face, including the region around the eyes. It reduces sun damage, improves skin texture and tone, decreases brown spots, sun spots and pigmentation on face, neck, chest, back, forearms and hands. It is able to treat a wide variety of skin types I to VII. The working principle of the Nd: YAG 1064nm long pulse laser is the emission of intense beams of light that pass safely through the epidermis to the underlying stratum where hair follicles are eliminated by the selective phototermolysis process as a means of capillary treatment without damaging the skin. The wavelength of light created by the laser targets the follicular germ cells in the hair shaft, which once absorbed by the hair melanin can be destroyed. The latest innovation in hair removal is the N d: YAG 1064 nm long pulse laser . All you need for skin and hair treatment. The multi application platform automatically recognizes the 8 different handpices available. Fill in your details that one of our consultants will contact you soon.